A two-car crash totaled both vehicles, but caused only minor injuries Friday morning near the Rocky Fork Truck Stop at the intersection of U.S. Route 50 and SR 753 near Rainsboro. According to the Ohio State Highway Patrol Wilmington Post, one driver was charged with failure to obey the stop sign on SR 753, which caused the crash and sent both vehicles across U.S. 50 into a ditch. Both drivers were transported to Highland District Hospital with minor injuries by the Paint Creek Joint EMS/Fire District. 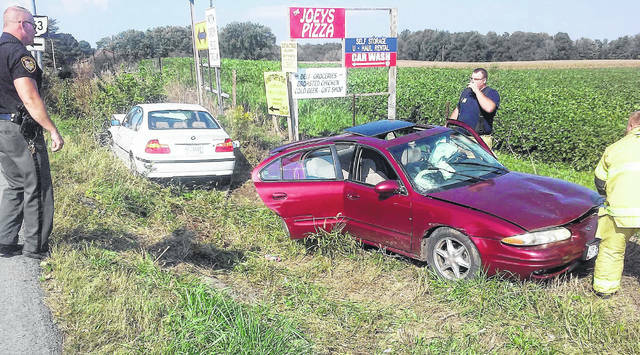 https://www.timesgazette.com/wp-content/uploads/sites/33/2018/09/web1_crash-at-753-50-1.jpgA two-car crash totaled both vehicles, but caused only minor injuries Friday morning near the Rocky Fork Truck Stop at the intersection of U.S. Route 50 and SR 753 near Rainsboro. According to the Ohio State Highway Patrol Wilmington Post, one driver was charged with failure to obey the stop sign on SR 753, which caused the crash and sent both vehicles across U.S. 50 into a ditch. Both drivers were transported to Highland District Hospital with minor injuries by the Paint Creek Joint EMS/Fire District.